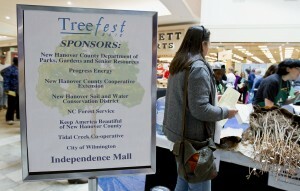 TreeFest, an annual distribution of tree seedlings, will be held Friday, Jan. 22 and Saturday, Jan. 23, 2016 from 10 a.m. to 5 p.m., or until trees run out, in the JC Penney end court inside Independence Mall. Increase tree canopy and biodiversity in your yard by visiting TreeFest. Choose any combination of trees from our extensive list, many of which are native to our area. Limit of 5 trees per household. Tree species include Atlantic white cedar, bald cypress, black gum, black walnut, chikasaw plum, crabapple, crape myrtle, eastern red cedar, longleaf pine, overcup oak, persimmon, river birch and white oak. Please note: species availability is subject to change without notice and are available first come, first serve. A suggested donation of $3 per household will help ensure that TreeFest will return next year. TreeFest is funded by the donations received from participants during the event. Your seedlings will be wrapped in wet newspaper and a compostable bag that may be reused or planted with your tree, then placed in a plastic bag for transporting. Please consider bringing a plastic grocery bag to reduce the number of new plastic bags in our community. Because the trees and grasses will live a very long life, a little planning at home before you come to TreeFest can save you lots of time down the road. Consider the size of your site, whether utility lines exist above and below ground, proximity to buildings and site conditions such as soil type, drainage or sun exposure. There will be experts on hand to help you decide which tree will work best for your site, as well as how to take care of them. The trees are grown in Goldsboro at the NC Forest Service Nursery. They should be kept moist and planted as soon as possible; ideally the same weekend as TreeFest. Winter is a great time to plant trees in our area. TreeFest began in 1997, after hurricanes Bertha and Fran destroyed many trees in the area. The TreeFest Committee organizes the event; members and sponsors include Duke Energy Progress, North Carolina Forest Service, Keep New Hanover County Beautiful, UNCW, New Hanover County Department of Parks and Gardens, New Hanover Soil and Water Conservation District, City of Wilmington, Wild Bird and Garden and Independence Mall. For more information, contact TreeFest Committee member Jennifer O’Keefe at 798-7564 or jeokeefe@nhcgov.com.